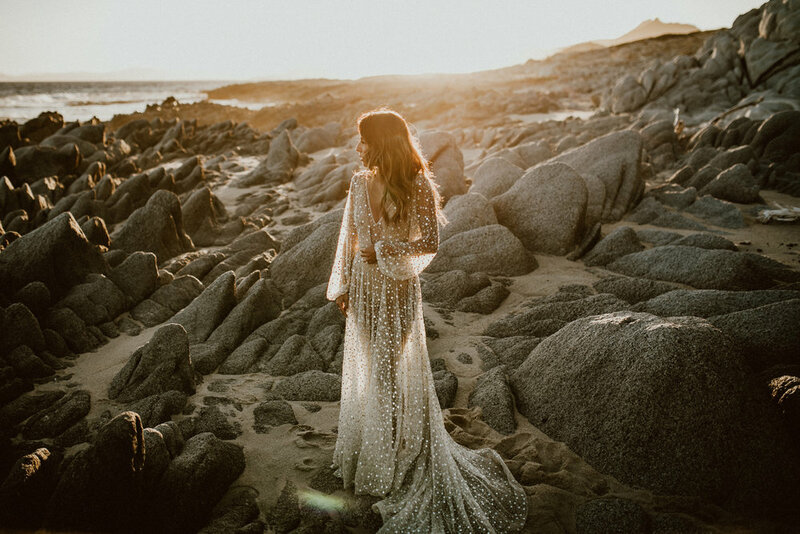 Back in 2016 I vividly remember pinning this Nala Dress by Chosen by One Day Bridal to my "I do" board. At the time, Andy and my relationship was definitely getting serious and although I knew we would some day get married, it seemed very far in the future. 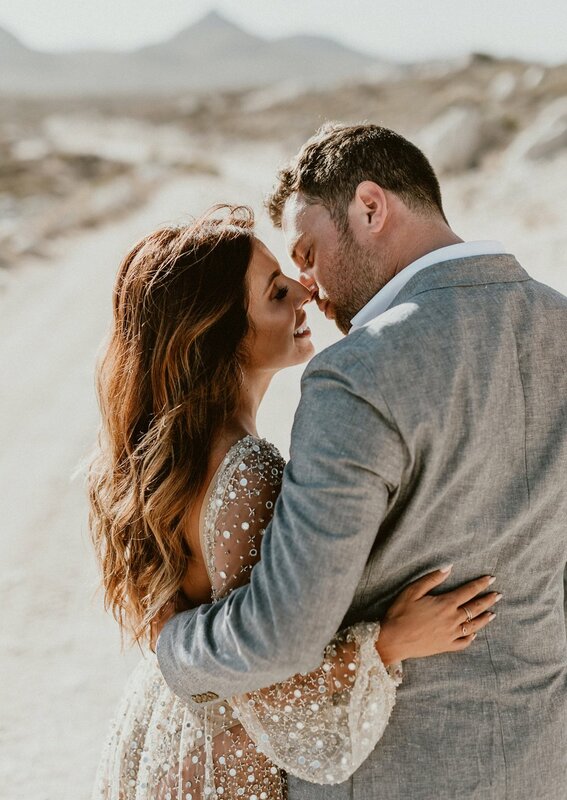 I never in my wildest dreams thought I would ever step foot into the dress, let alone create some incredible memories with my HUSBAND while wearing it. Fast forward to March 19, 2018 (two days after our wedding). We were both on top of the world after a weekend filled with love and celebration, and to be honest, kind of exhausted. When we decided to opt out of engagement photos to do a post wedding shoot with our incredible wedding photographers it didn't occur to me how tired we would be after 3 days of go-go-go. 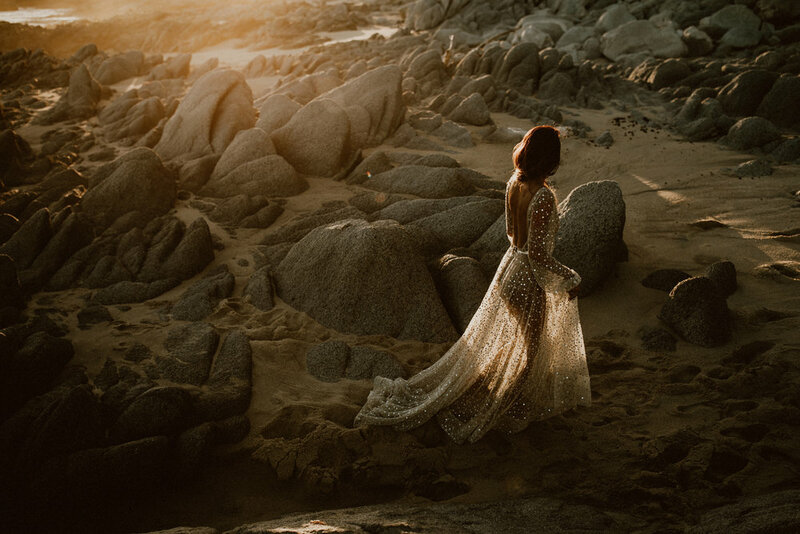 But somehow the exhaustion disappeared when we found ourselves standing barefoot at the southern most tip of the Baja Peninsula, not a single person in sight except for our photographers. I was in the custom head-to-toe beaded dress I had drooled over years ago (which was also my wedding reception dress) and Andy in his wedding welcome party suit. I remember looking at my new husband and getting an overwhelming feeling of TOGETHER we can do ANYTHING. Thank you to the One Day Bridal team for making my dreams a reality. This was my fairy tale wedding dress and I have never felt more beautiful than when Andy saw me wearing it for the first time. We will cherish these photos and the memories made over our wedding weekend forever and ever!